Media reports have confirmed the sale of Author Solutions, and that Penguin Random House will abandon their venture into expensive self-publishing and concentrate on traditional publishing in the future. For those who may not know, Author Solutions is the parent company of the self-publishing companies/imprints AuthorHouse, iUniverse, Trafford Publishing, Xlibris, Palibrio, and Booktango. The following article in the Financial Times, explains the reasons for the sale. Penguin Random House said on Tuesday that it had sold Author Solutions, which allowed writers direct access to publishing tools, to an unnamed affiliate of US private equity firm, Najafi Companies. Financial terms of the deal were not disclosed, but analysts said the price was likely to be a fraction of the $116m that Penguin paid for Author Solutions in 2012. Penguin, owned by Pearson, merged with Random House, owned by German media group Bertelsmann, in 2013. Pearson sold the Financial Times in November. Self-publishing has been growing rapidly, with more authors designing and selling their books without the backing of a traditional publishing house. Author Solutions has sought to capitalise by offering a variety of services to independent authors, including “web-optimised” press releases for $1,299 each. The company was subject to frequent complaints from authors. Two class action lawsuits against Author Solutions were settled last September without the company admitting responsibility. Orna Ross, founder of the Alliance of Independent Authors, said that Author Solutions’ business practices were “problematic”, contrasting them with those of Amazon-owned CreateSpace. “The lesson for publishers is to be more author-centric, rather than trying to sell expensive and unnecessary services,” she said. Author Solutions says it has worked with “more than 200,000 authors, helping them publish more than 250,000 titles” — suggesting that few customers use its services more than once. Its best-selling books to date include Andrea Perron’s ebook House of Darkness House of Light and Don Failla’s print title The 45 Second Presentation That Will Change Your Life. Penguin Random House will limit itself to traditional publishing. “With this sale, we reaffirm our focus on consumer book publishing through our 250 imprints worldwide,” its chief executive Markus Dohle said. It is no surprise that Author Solutions, aka Author House, has been sold off. Their business model has often been called into question, and from my own experience, they used high-pressure selling techniques. On three occasions, a representative from AuthorHouse pestered me for weeks on end, by phone and email, trying to get me to pay to publish my books with them. At around $4,000 per book, why would I bother? Even when I explained that it cost me nothing to self-publish my books, so I had no need for their services, they still continued to hound me. All I can say after reading that Penguin Random House has shed Author Solutions is goodbye and good riddance. Note: While this article is now a little aged, it is still a timely warning to new authors to avoid vanity publishers such as AuthorHouse. Why spend, and waste, thousands of dollars for something that you can now by yourself, for free. Never confuse vanity publishing with self-publishing. 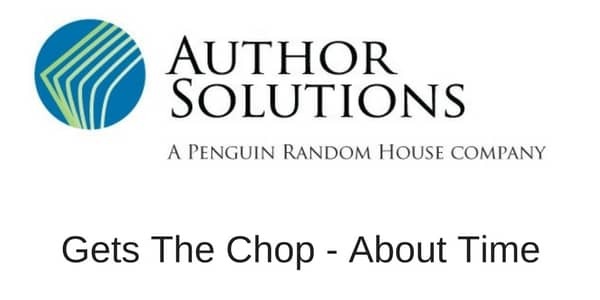 For more information regarding AuthorHouse and Author Solutions, you may want to read our newer article about vanity publishers.